If the smell of a casserole in the oven on a cold winter night warms your soul, you’re not alone. There’s something special about a hearty home-cooked meal. 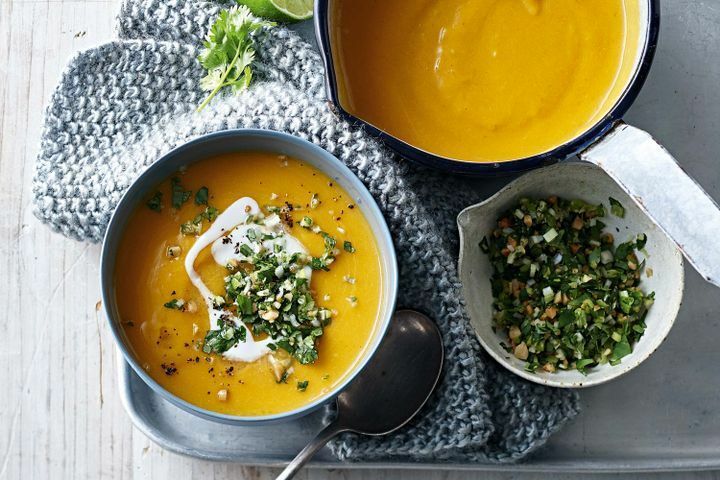 We’ve found some great recipes for you to try this winter. Enjoy! 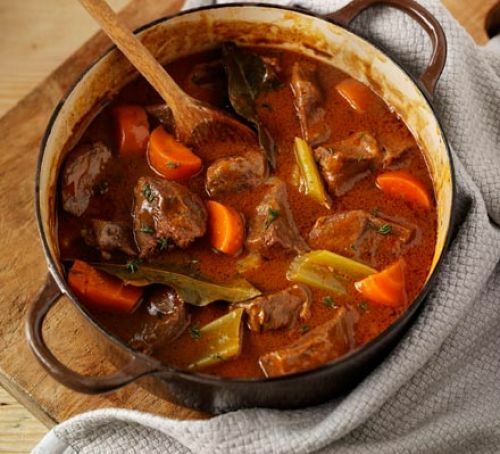 A traditional braised beef stew with thick, rich gravy – an ideal recipe for cheap cuts as slow-cooking guarantees a tender dish. 1. Heat oven to 160C (140C fanforced). Put the kettle on. 2. Put the celery, onion, carrots, bay leaves and whole thyme sprig in a flameproof casserole dish with 1 tbsp oil and the butter. 3. Soften for 10 mins, then stir in the flour until it doesn’t look dusty anymore, followed by the tomato purée, Worcestershire sauce and beef stock cubes. 4. Gradually stir in 600ml hot water, then tip in the beef and bring to a gentle simmer. 5. Cover and put in the oven for 2hrs 30 mins, then uncover and cook for 30mins–1hr more until the meat is really tender and the sauce is thickened. 6. Garnish with the remaining thyme leaves. 1. Heat oil in a large saucepan over medium-high heat. Cook onion, stirring occasionally, for 5 minutes or until softened. Add pumpkin and potato. Cook, stirring for 5 minutes. Add garlic. Cook, stirring for 1 minute or until fragrant. 2. Add curry paste to pan. Cook, stirring for 2 minutes, to coat vegetables all over. Add stock, stirring to combine. Cover. Bring to the boil. Reduce heat to low. Simmer for 15 minutes. Remove lid. Simmer for a further 15 to 20 minutes or until vegetables are tender. Remove from heat. Stand for 5 minutes. 3. Using a stick blender, blend soup until smooth. Return to medium heat. Stir in 1 cup coconut milk. Season with pepper. Cook, stirring occasionally, for 5 to 6 minutes or until heated through. 4. Meanwhile, combine peanuts, coriander, green onion and lime juice in a small bowl. Ladle soup into bowls. Serve drizzled with remaining coconut milk and sprinkled with peanut mixture. 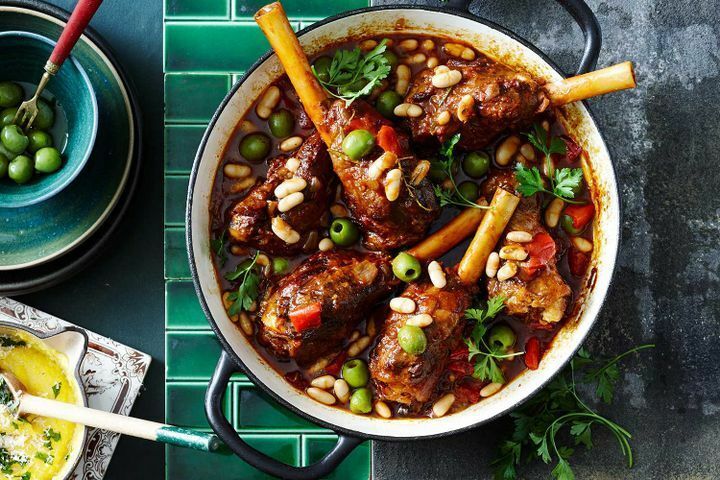 With fresh woody herbs and sweet marsala, these Italian-style lamb shanks will please the whole family. 1. Heat oil in a large heavy-based saucepan over medium-high heat. Cook shanks, in 2 batches, for 5 to 6 minutes or until browned all over. Transfer to a plate. 2. Add onion and capsicum to pan. Cook, stirring, for 5 minutes or until onion softens. Add garlic, lemon thyme, rosemary and tomato paste. Cook for 30 seconds. Add marsala. Simmer for 30 seconds or until reduced by half. Stir in stock and tomatoes. 3. Return shanks to pan, turning to coat in mixture. Cover. Bring to the boil. Reduce heat to low. Simmer, turning shanks every hour, for 2 hours 30 minutes or until tender. Remove lid. Add olives and beans. Simmer, uncovered, for a further 30 minutes. Sprinkle with parsley. 1. Preheat oven to 140°C. Heat a large flameproof casserole pan over medium-high heat. Add the sausages and cook, turning occasionally, for 8 mins or until brown all over and cooked through. Transfer to a clean work surface. Thickly slice diagonally. 2. Add half the pork to the pan and cook, turning occasionally, for 5 mins or until brown all over. Transfer to a plate. 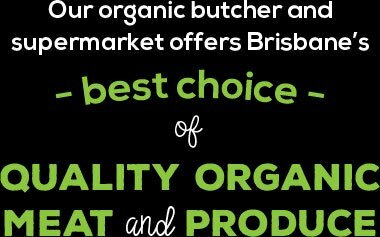 Repeat with remaining pork. 3. Add the bacon, onion, fennel and garlic to the pan. Cook, stirring, for 5 mins or until onion softens. Return sausage and pork to pan. Add white beans and stir to combine. Pour over the wine and bring to the boil. Cook for 2 mins or until wine reduces by half. 4. Add the tomato, stock, thyme, rosemary and bay leaves. Bake, covered, stirring occasionally, for 1½ hours or until pork is very tender. Season. Increase oven to 160°C. 5. Combine breadcrumbs, butter and thyme in a bowl. Sprinkle over pork mixture. Bake, uncovered, for 30 mins or until golden brown. Serve with beans. 1. Heat the oil in a large saucepan over medium-low heat. Add the cumin seeds, mustard seeds, cinnamon and cardamom and stir for 1 minute or until aromatic. Add the curry leaves and stir for 1 minute or until aromatic. Add the onion and stir for 2-3 minutes or until softened. Add the ginger, garlic and chilli and stir for 1 minute or until aromatic. Add the garam masala and turmeric and stir for 1 minute or until aromatic. 2. Add the tomato and yoghurt. Stir for 1-2 minutes or until combined. Add the beef and stir for 5 minutes or until the beef changes colour. Reduce heat to low. Cover and cook, stirring occasionally, for 15 minutes or until a sauce forms. 3. Stir in the water. Season. Cook, partially covered, stirring occasionally, for 1 hour 30 minutes or until the beef is tender. Add the pumpkin. Cook, partially covered, stirring occasionally, for 30-40 minutes or until the pumpkin is tender. 4. Stir in the coriander. 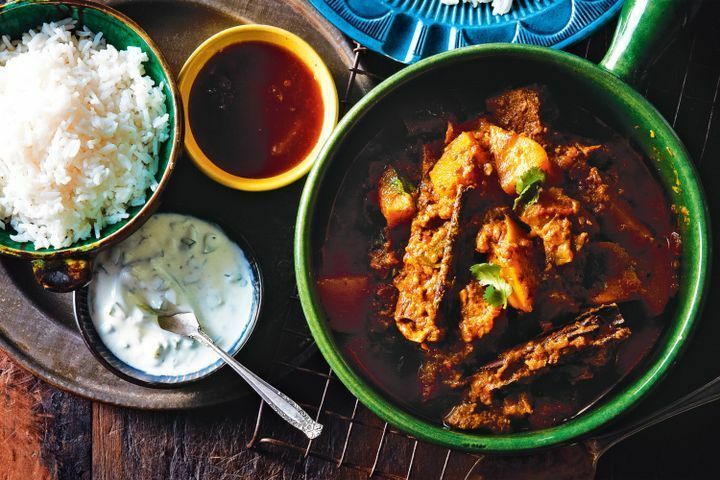 Serve curry with steamed rice, chutney and raita. 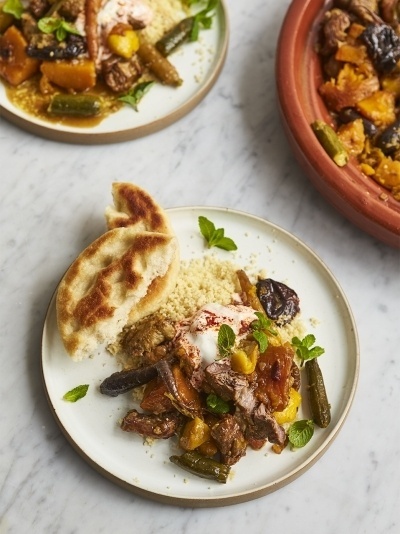 Inspired by Simon Pegg’s time spent on location in Marrakech, this beautiful lamb tagine recipe has been designed to transport him back to the wonderful meals he enjoyed at the family-run hole-in-the-wall-style restaurants found at the edge of the Medina – the spices are brilliantly subtle, and the aromas are just incredible. It’s seriously tasty stuff! 1. Place the saffron in a small bowl, cover with 2 tablespoons of boiling water and leave to steep. De-stone the prunes, place in a bowl and just cover with boiling water to plump up. 2. Peel and finely chop the onions and garlic, then season with the ginger and a pinch of sea salt and black pepper. 3. 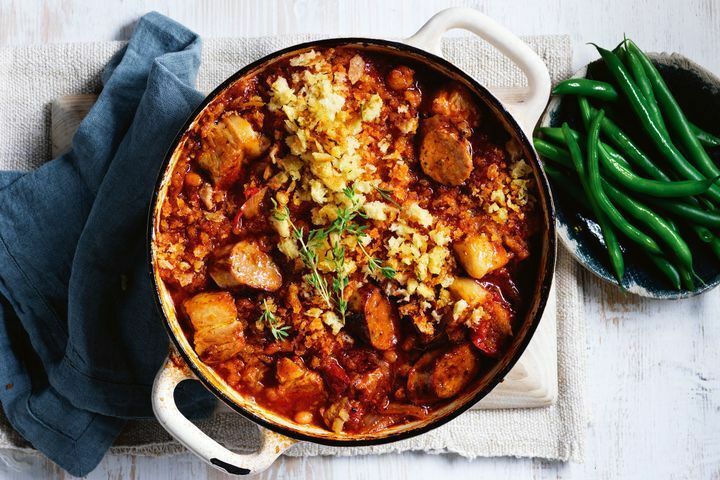 Place a tagine or large casserole pan over a medium heat, drizzle in 2 tablespoons of oil, then add the cinnamon, and cook for 1 minute to flavour the oil. 4. Add the lamb, season with salt and pepper, then cook for a further 5 minutes, or until browned all over. 5. Push the meat to one side, placing the cinnamon stick on top, then add the seasoned onion and garlic, and cook for 5 minutes, or until softened and caramelised. 6. Gently scrub the zucchinis and carrots. Peel and deseed the pumpkin, then roughly chop into 3cm chunks. 7. Add the whole carrots, zucchinis and pumpkin, followed by the prunes (with soaking water), and saffron (with soaking water) and top up with 200ml of water. 8. Bring to the boil, then cover and cook over a low heat for 1 hour 30 minutes to 2 hours, or until the lamb is tender and the veg is cooked through, adding splashes of water to loosen, if needed. Taste and season to perfection. 9. For the flatbreads (start making these when the lamb has 1 hour to go), mix the flours together in a large bowl, then add a good pinch of salt. Stir the yeast into 275ml of warm water, then add to the flours and mix to form a pliable sticky dough, adding a splash more water, if needed. 10. Divide the dough into 6 balls, then flatten each into a 10cm round, roughly 1cm thick, and place on a lightly oiled tray. Using your fingers, press gently into the top of each to create grooves. Cover the tray with a damp tea towel and leave to prove for 45 minutes. 11. Drizzle 1 tablespoon of oil into a non-stick frying pan on a medium heat. Uncover the flatbreads and fry for a couple of minutes on each side, or until golden and perfectly charred – you may need to work in batches, topping up the oil, if needed. 12. Place the couscous in a bowl, season with sea salt and add the cloves, then just cover with boiling water and a drizzle of oil. Pop a plate on top and leave for 5 to 10 minutes to fluff up. 13. When the couscous is ready, fluff it up with a fork. Fold the harissa through the yoghurt. 14. Serve the tagine, couscous and flatbreads with the harissa yoghurt and finish with a scattering of fresh mint leaves.